Interview with Jackie Fenn, co-author of "Mastering the Hype Cycle: How to Choose the Right Innovation at the Right Time"
The hype cycle occurs with almost every innovation. It's tied to the human emotional response to the new and novel. Knowing how the hype cycle works can help us avoid its traps, and also open opportunities for individuals and companies. Vern Burkhardt (VB): You are a Vice President and Gartner Fellow at Gartner Research. What does it mean to be a "Gartner Fellow"? VB: When you observed a common pattern in emerging technologies and published "When to Leap on the Hype Cycle" in 1995, the year after you joined Gartner Research, were you aware this was a major discovery? And did you anticipate it would become one of Gartner's research methodologies in its consulting practice? Jackie Fenn: I didn't at the time. I put it out as an observation of a repeating pattern that happened in technology, and I populated the shape of the hype cycle curve with some examples of technologies. It was only when a couple of our clients asked whether we were going to update the Hype Cycle paper the following year that we started doing it annually. And then other analysts within Gartner started using the concept in their areas of specialization. It snowballed from there. When we saw our clients start to use it for business decisions we moved to the special report, and a comprehensive approach to applying it. VB: What is the hype cycle and why do we need to master it? Jackie Fenn: The hype cycle is a common pattern we see in technology, and in innovation more broadly, where something launches an innovation into people's awareness – an 'innovation trigger'. Quickly there is a lot of excitement about the innovation and its potential. You get a 'peak of inflated expectations', where people think this new thing is going to bring world peace but inevitably it doesn't. Then you get a backlash against the innovation. It's harder than we thought; it's not giving us the benefits we expected. This results in a 'trough of disillusionment.' At some point, and that time can be variable, the innovation starts delivering reliable value so more and more people are comfortable adopting it. The innovation now moves up the 'slope of enlightenment', which is where you get methodologies kicking in with an understanding of how to use it, and where not to use it. And then you move to the 'plateau of productivity' where most people are comfortable adopting it. When we first put out the hype cycle that's where we stopped. On occasion, as we do in the book, we continue tracking the innovation through its full lifecycle. Through the 'swamp of diminishing' returns, which is where you are holding onto something because you don't want or can't afford to replace it, and then on to the 'cliff of obsolescence' where you are buying spare parts for it on eBay. VB: Would you talk about the 'second peak of reflated expectations'? Jackie Fenn: While the swings from the peak of inflated expectations to the 'trough of disillusionment' are dramatic, the transition from the trough to the 'slope of enlightenment' is often more subtle. A second peak sometimes happens right after the trough when you get a particularly heavy market push, usually on the vendors' side. The surge of vendors' activities may be due to such things as release of new product versions or accelerated marketing activities. Expectations again accelerate in a noticeable, often spectacular way. Sometimes the move out of the trough and up the slope is so subtle that people miss it. Sometimes it's associated with more fan fare. People in the adopter community may have forgotten about the first peak of inflated expectations, or they may not even have been around when it happened. VB: Why do we need to master the hype cycle? Jackie Fenn: The danger we see over and over again is that people are reactive to the hype cycle, so they're rushing in when the hype's up and abandoning it when the hype's down again. They do not understand why they are or are not using an innovation. An awareness of the hype cycle phenomenon helps people realize they need some other way to decide whether to adopt innovation, rather than just because their executive's waving an airline magazine at them saying, "Hey, everybody's implementing this innovation. We've got to do it, and we've got to do it now." VB: The hype cycle can be used to explain an organization's internal expectations when an innovation is being implemented. Can it also be used to explain our personal reaction to innovation and change? Jackie Fenn: Absolutely. Although initially we thought it was about technology, we rapidly realized it was about people's reaction to anything new. It's about each individual's reaction to novelty, and the reaction is compounded when you get communities of people. The bandwagon effect starts to kick in as more and more people get the same excitement, and build on each other's ups and downs through the hype cycle. So, it is very much a personal reaction to innovation and I've had more than one person tell me it applies perfectly to their personal relationships. I think it's pretty broadly applicable. VB: Gartner publishes an annual report on the hype cycle of emerging technologies. The most recent one was published July 9, 2008. How much effort is involved in producing this annual report, what value is it to companies, and how do they generally use it? Jackie Fenn: That is a major effort within Gartner over a period of two to three months. Most parts of Gartner are involved in putting together the special report with sixty to seventy different hype cycles covering all areas of IT, different application areas like CRM, and a number of vertical cuts such as government and healthcare. It identifies the differences in various industries and how they're responding to technologies. Our clients use the information in various ways. I think the major uses are to provide some inspiration and as a checklist to identify what's out there. It provides access to information about technologies that may be relevant to their businesses. They consider the technologies and, if there's something they haven't come across on their own, they may do further research to see how relevant it is to them. If it's something they are looking at, they might confirm how fast the technology is moving. And whether our assessment of how mature it is or how beneficial it is lines up with their own thinking. We see clients making their own hype cycles about technology or other innovations. They pull from the Gartner material and populate their own hype cycles with the subset that's relevant to them. We see that quite a lot. VB: Is one of the lessons of the hype cycle that most breakthrough innovations take a long time from initiation to the point where significant benefits are realized – to the point of "mainstream adoption"? Jackie Fenn: Yes, I think that's true, although I would modify that to say it takes a long time to be able to reliably anticipate the benefits. The question is about the reliability of the benefit. You do get early adopters who get benefit from an innovation. It's not that no one can do well with the innovation during the early stages. Some companies can, but there are plenty of others that can't because they're either applying it in the wrong place or they're not setup to manage the extra risk of a new technology. At the individual company level, when you are bringing in an innovation there are often internal hype cycles that are project related. The timing to the productivity phase will be impacted if the project is running behind schedule and over budget. These are the foremost challenges. Or there may be adoption challenges that haven't been anticipated. VB: Would you talk about your observation that early entrants into a market for innovative products, especially those that are highly hyped, are often not the ones that dominate in the long run? Jackie Fenn: That's from the vendor's side. I look at a lot of the disruptive technologies where you have vendors coming up with something that is quite new and exciting. On the whole, I think the early adopters understand they're looking at technology capabilities, and by the time they're using that technology or the technology has gone mainstream, those early vendors quite likely will have been bought up by other companies. Or they're non-existent. If large vendor companies see an innovation doing really well, within a year or two they'll either develop it themselves or they'll buy the capability. At the early adoption stage you're looking at what the technology can do for you. You want to get vendors who are going to last as long as they can, but you can't guarantee that these innovators are going to be the ones around for the long term. VB: Will understanding the hype cycle significantly improve one's ability to identify risks and major opportunities for business growth? Jackie Fenn: It's one factor. There's an awful lot else that goes into the strategy process. I'd say the hype cycle is an element in figuring out when you're going to bring in innovation assets that are going to help deliver your business strategy. The way it may inform business strategy is when you have a good methodology and process, and people who can look at early stage hype cycle technologies, realize they're in an early stage, and recognize the opportunities while managing the risk. We might see something that's on the rise. We might know there's something significant happening with mobile robots, for example, and think it could transform our business in our particular industry. Even though it might be high risk right now, we should make sure the top level strategists in our company know about the innovation, and take it into account when they're developing a strategy for what we're going to do in our warehousing operation. I think the hype cycle can inform the development of a business strategy, but it's certainly not all there is to coming up with an appropriate and effective growth strategy. VB: You say, "The best way we know to (counter the belief that you are immune to the effects of the forces underlying the hype cycle) is through a systematic, disciplined framework that ensures that you incorporate the lessons of the hype cycle into every adoption decision that you make." Have you found that business leaders realize they are not immune to these forces? Jackie Fenn: Some haven't recognized it. Even if the do know they're not immune, the challenge still is they often don't know what to do about it. That behavior is more readily recognized in other people even though it applies to all of us. The challenge is having a process to make sure you're reminded to take the actions necessary to help prevent falling victim to the hype cycle. VB: For centuries people have been awed by the possibilities in a new innovation and later disappointed by its actual benefits, at least up to the "Trough of Disillusionment". You say in the late 1990s many people caught the "Internet bug", including the financial press, business journalists, business thinkers, stock market analysts, and some blue chip companies. Although the Internet is having and will continue to have a dramatic impact on business processes, why were so many people caught by the e-business hype cycle? Jackie Fenn: Yes, the e-business period was new, genuinely exciting. The Internet was and still is a big deal. The e-business hype cycle involved exciting technologies, lots of interesting new capabilities, and was based on communications. A lot of the big bubbles seem to be based on communications. In one sense it is justifiable enthusiasm because the communications and connectivity technologies really are transformational. But the economic reality remains in place, so at some point the bubble can't keep going any higher and there has to be a correction. The growth of infrastructure leads to big cycles of technological change over several centuries. It's usually the connectivity in the infrastructure that drives the big economic bubble. People get very excited because it has such a huge impact on society in the longer term. Canals during the first industrial revolution, roads, cars or the railroad bubble are examples. VB: You say that even key management processes such as strategizing and innovation are subject to the hype cycle; for example, value curve or "blue ocean" strategies, open innovation, and strategy maps. Is almost everything in business explained by the hype cycle? Jackie Fenn: I think there's a lot that is explained by the hype cycles. You might view business strategies as overlapping hype cycles. There's a common goal in business that is never quite solved. Every eight to ten years there's a new major business initiative or business solution that tries to address it in slightly different terms or in different ways. Maybe it's productivity and workflow, knowledge management, or business process management. All of these kinds of juggernaut areas are trying to do somewhat similar things with new sets of approaches and technologies. And each time you get the hype cycle effect of over and under enthusiasm, and then the reality of what it can really do sets in. VB: Would it be going too far to suggest that the hype cycle explains a wide range of phenomena such as the dot com boom and bust, fluctuations in housing demand and prices, stock market fluctuations, and other consumer trends? Jackie Fenn: There are a couple distinctions we try to draw. One is between hype cycles and economic cycles. There are economic cycles that go up and down. They can be related to a hype cycle, like the Internet business example we discussed, which caused an economic cycle of consecutive up and down movements. The economic cycles tend to be more typically up and down over time, rather than leveling out into a plateau of productivity. What distinguishes a hype cycle is there has to be something tangible you are tracking that causes the effect, something that will reach maturity and the plateau of productivity. Otherwise the up and down may be related to a fad or the cycle may be something in the economy such as house prices. That's the real criteria for determining whether or not it's a hype cycle or some other kind of up and down effect. In the case of our current economic crisis, for example, you could say that the financial instruments that contributed to the problems went through the hype cycle. If there is something of long-term value, those instruments will pull out of the' trough of disillusionment', and start being used in reasonably productive ways. VB: Has the speed of communication via the Internet and mass media led to accelerated expectations and ever-shorter timeframes for the hype cycle of innovation? Jackie Fenn: On the consumer side, yes. We see a lot of technologies moving very rapidly. We see consumer technologies, in particular, sometimes bypassing much of the 'trough of disillusionment'. The design challenges of the Apple iPhone around batteries and other technological components were pretty much laid out as general information even before the device was available for sale to the public. There's a highly visible knowledge and discourse in the market around a technology's challenges a lot earlier because there's more people with their hands on it, experimenting with it. What hasn't necessarily accelerated, though, is the business hype cycle. There are lots of individuals trying out consumer-oriented innovations, figuring out if they work for them personally. An example would be Facebook and MySpace. Even though many people in the business environment would like to move quickly to adopt such new and exciting technologies, problems will be encountered when trying to make some of those innovations work at the enterprise level. In some cases these problems will be a set back, and it may take a year or two to figure out how to implement and gain benefits from these innovations. In most cases the enterprises' trough of disillusionment with consumer technologies is due to security considerations. The message may be that the innovation is great, but we don't know how we can use it in our organization in a secure way. This may apply to Facebook and the latest Apple iPhone, for example. There's often a year or two between something being very popular, people talking about it and wanting to use it, and the ability to use it productively. Sometimes it's not whether the thing actually works – it's the value proposition. A lot of discussion has been occurring in many organizations around Web 2.0 technologies, wikis, blogs and other social media. They are still trying to figure out what, in a corporate world, is the value proposition for those kinds of technologies. They're useful in some situations, but for an enterprise use the questions about payback and how to make them valuable is often less clear than in the consumer market. That's another example of why the enterprise hype cycle hasn't speeded up to the same degree as has occurred with consumer-oriented innovations. VB: What is the difference between an inventor and an innovator? Jackie Fenn: There's only one person who's going to invent something, but there's many more people who are going to use it in innovative ways. Innovation can be about inventing something – you may be the first person or company to try something new. For every one of those, there's hundreds who are trying to take that idea and apply it in their organizations. Very often they're not doing exactly what the first person or company did, they're adapting it. There's a level of innovation in how they're going to make it work, and how they're going to apply it to their circumstances. So, there's a distinction there. Even with pure invention, if you look at Thomas Edison as a classic example, he didn't necessarily just invent things. He had a whole lab so there were a lot of people who were collaborating. He wasn't just an inventor; he was a businessman as well. When he and his team invented something he'd figure out how to create the infrastructure within society to make it valuable. The light bulb wouldn't have been worth a lot, it wouldn't have been nearly as useful if he hadn't figured out how to generate and distribute electricity. That broader ecosystem for an invention, which involves more than the inventers, is critical to broader adoption. VB: Is one of the four traps of the hype cycle – adopting too early, giving up too soon, adopting too late, or hanging on too long – especially worrisome and threatening to the survival of organizations that don't understand the hype cycle? Jackie Fenn: You're looking at company destroying decisions. Occasionally coming in too early might be worrisome, especially if you bet the company on one particular innovation. But most companies, especially larger ones, don't do that. They have a portfolio of things they are trying so it might be an expensive mistake but it's not usually a fatal mistake. The example used in the book is of Safeway abandoning an innovation related to a customer loyalty program, and then never catching up again. Serious threats to survival are probably cases when companies don't move soon enough so they're still wallowing in the 'trough of disillusionment'. They think a specified technology is no good, or they haven't noticed that it's being picking up by other companies. They risk the danger of getting too seriously behind to ever catch up. VB: You say, "In making decisions, people display a strong bias toward alternatives that perpetuate the status quo'". Would you talk about that observation? Jackie Fenn: That's drawn from psychological experiments that show people, especially in a team environment, will tend to favour something that causes them not to have to change. It's generally easier for people to decide to keep doing the same thing, probably the same projects, and keep going on the same path rather than knowing they have to do something different. Most people would rather not try to change than step up to change and then fail. VB: You say we tend to explain our own behavior in terms of the situation or context we are in but the behavior of others in terms of their personality or disposition. How can we train ourselves to not see the world as "them" and "us"? Jackie Fenn: That also draws from psychological experimentation that's been done about people's behaviours. Behavioral economics provided a wealth of information that we drew on a lot when writing Mastering the Hype Cycle. It provided data, for example, about understanding how people make decisions. I think behavioral economics will become a much larger part of business going forward because the behavior effects are so well documented. There have been articles in Harvard Business Review, for example. Most companies don't even know that this body of knowledge exists, and they certainly aren't bringing those things into their business processes. The predictability of the innate biases we have developed for good reasons, such as survival, is scary. When these innate biases are applied to some situations they can get us into trouble. The best approach is to have steps, activities, and processes to remind us about the innate biases we have, and be constantly reminded to try and avoid the negative effects they can cause. VB: You say, "…adoption decisions (about innovation) should be made by a careful and deliberate process…" What are the implications of not having a "mindful approach" – a consistent and disciplined process for deciding when to adopt and implement an innovation? Jackie Fenn: You'll end up being reactive because the force of the hype cycle is so strong. You won't be constantly aware that the reason you feel so excited about an innovation is because you've just had three conversations with other people who are excited about the innovation. And everybody seems to be talking about it; it's the buzz. You're excited because of this hype rather than because there's any real value to your company in adopting it. It's that kind of reactive response, without really understanding why you're doing something, which ends up being the danger. VB: Would you tell us why having a corporate core competence and a well-formulated mission statement helps a company decide where to focus on innovation? Jackie Fenn: The first stage of the process is focusing on your core competence, mission statement, or other ways to establish your corporate goals for the year. You need some way to align the innovations you could bring in with something that is meaningful and key to the company. If you are the CEO, you can drive both your mission and innovation. Often other people in the company are in a position where they see opportunities, want to bring an innovation into the whole company or their particular area in the business, and any time they do so there's a risk associated with it. You want to make sure the company is taking those risks for the right reasons. You want those initiatives to be aligned with the way the company is heading, or what the company thinks is important. Management's views of what their strategy is, and the company's core competence can be of value in deciding which innovations to adopt. VB: In 1994 Gartner analyst Martin Muoto created a four-stage process for selecting and implementing an innovation. You expanded it to a six-stage process you call 'STREET' – scope, track, rank, evaluate, evangelize, and transfer. Would you talk about the insights you received from clients and how it led to your refinement of this process? Jackie Fenn: The two stages that we added were 'rank', and 'evangelize'. We added the rank stage, not because it's a big thing that takes up a lot of time, but because it's something that can be neglected. It's one of the key ways to defend against hype cycle traps. When you review an innovation opportunity you need a pretty strong set of decision points to determine whether or not it passes various tests. The tests may be, for example, relevance to corporate strategy, generating efficiency or improving customer service. Most companies don't have that type of approach. The first step in achieving some kind of balance in the portfolio of technologies you are adopting is to look at the wide range of available technologies. There are some companies that do a technology scan every year. They bring together a set of candidates and prioritize them according to which are the most important for their business, and which ones look like the timing is right for adoption. You can also apply some of these same approaches to evaluating and deciding on innovations individually. You use 'gates' – a set of checks – to assist in deciding if the innovation will enable you to earn more money, is within tolerable levels of risk, and whether there is a committed champion for implementation. These kinds of questions enable you to separately assess an innovation, but not in relation to other possible alternatives. The ranking stage stresses the need to have checks and balances, rather than run off with the latest, greatest thing. So that was the first stage we added. The second stage we added was 'evangelize', because we work a lot with heads of emerging technology teams within IT organizations who for a living are involved in promoting the adoption innovation. They have to track, evaluate, and move out emerging technologies and innovations. They told us they spend an inordinate amount of time on this particular activity – it may not even be formalized. It isn't only done after the evaluate stage in the 'STREET' process; it's something that happens throughout the innovation adoption cycle. One of my clients calls it 'hand to hand combat'. The point is the people who know what a particular innovation can do may not have the authority to decide it will be implemented in their organization. They need to have face to face contact with the key people to inspire these decision makers and potential implementers about the functions and benefits of the innovation. We characterize that as being an evangelism role. VB: Why did you choose to use the words 'evangelize' and 'evangelism', given their association with religion? Does it require religious-type zeal to overcome people's fear of, and resistance to, innovation in organizations? Jackie Fenn: It's actually a term that has been used since the Internet era. It refers to helping people understand the benefits of an innovation. We saw some companies having titles of Chief Evangelist, for example, and there are others with the term 'evangelize' in their job titles. It's less for religious connotations but more about inspiration. It's not enough to just to say, "Here's a technology, and here's what it does." You have to figure out how to translate the technology into business terms, and inspire and excite people as to what's possible. You have to be realistic about what can be achieved, but the inspirational role is what made us think the 'evangelist' term was appropriate. VB: What advice would you give leaders of companies about how to effectively assess the potential benefits of, and subsequently adopt, an innovation? Jackie Fenn: I would point to the 'STREET' process in terms of how to approach innovation. VB: What aspects of the hype cycle and the 'STREET' process still need study and further development? Jackie Fenn: We've traditionally assessed innovations in a subjective way by using our Gartner analysts, who are tapped into our clients, lots of adopters, vendors, and research organizations. We get a really good sense of market vibes of new technology, and use that to position things on the hype cycle. We're interested in using quantitative models to measure where IT or other innovations are in the hype cycle. Recently, there's been text analysis software available that lets you examine written text from specified sources to assess whether it's talking positively or negatively about an innovation. We could use some of those indicators to figure out in a more objective way where the innovation is in the hype cycle. Google Trends give some capability, but it doesn't look at the tone and nature of articles to determine attitudes towards an innovation. For the 'STREET' process, we continue to determine best practices for the six different stages. We would like to align the 'Street' process a bit more with the processes used in the invention process. Quite often in companies there are distinct parts looking at products and services innovations while others are looking at technology or process innovations. VB: You say that in the twenty-first century innovation is very much about understanding the problem better so you can apply your technical knowledge in new and uniquely different ways in order to understand social, technical, economic, environmental, political, legal, ethical and demographic trends. Is this the essence of "competitive intelligence"? Jackie Fenn: It's a part of competitive intelligence if you are looking broadly at the trends that are out there. A major part of competitive intelligence is looking at what your competition is doing. That's needed and it tends to be how competitive intelligence is used in a narrow way today. What's my competition doing and how does what I'm doing compare against that? I think information collection needs to extend beyond that. A lot of companies not only look at what their competitors are doing, they look at what similar companies in other industries are doing. They also track more broadly global trends, demographic shifts, technology trends, and what opportunities these trends can provide. VB: Would you talk about the benefits of a portfolio approach to selecting which innovations to pursue – a balance of those directed at running, growing, and transforming the business? Jackie Fenn: It tends to help bring some balance into an organization's adoption activities. Quite often the balance needed is making sure that the organization is thinking about longer term, transformational, and generally higher risk activities that could also bring higher benefit. If a company doesn't have an innovation team, an emerging technology team, or something similar to that type of function, they tend to ignore the high benefit but high-risk opportunities because they are not set up to deal with them. A portfolio approach would have a portion of a company's new technologies directed at ways to run its processes more efficiently and upgrade existing things, a portion developing new areas of the business, and some innovations looking at long-term, radical shifts that would be transformational. Each company has a different percent that it is comfortable applying to those options in a portfolio, but even a conservative organization might want to spend a small percentage of its resources looking at some disruptive innovations. Even if the company is not going to be one that takes the initiative to start the disruption, somebody else will. Still that company needs to figure out what it's going to do about the disruptive innovation once it is introduced. It needs to examine the innovation in order to understand what is likely to happen. If you are a more aggressive company, a higher proportion of your portfolio is going to be directed at trying to disturb the status quo, stay a leader, and use technology and other innovations to drive ahead. The specific percentage may go down in an economic crisis. In these circumstances you may back up a bit in terms of how you assign or distribute your people resources and funding. Being aware that you want a certain balance in the types of new technologies you are adopting – and being explicit about it – makes it more likely that you won't forget to consider the high risk, high benefit things that can make a big difference for your business. VB: You say that when evaluating the merits of potential innovations "analysis paralysis is a common challenge…" This is also true of other decision-making processes. Will understanding the innovation hype and applying the 'STREET' process help eliminate this problem? Jackie Fenn: Analysis paralysis can be an issue with any process. The 'STREET' process in the hype cycle can help counter this tendency as it builds in decision points at key steps along the way. If you understand the hype cycle, then you know you are going to have to build in a decision point in the 'trough of disillusionment', because people are going to be asking serious and likely negative questions. You want to be able to evaluate the technology in terms of potential future benefits even when people are disillusioned because their high expectations have not been met, rather than have it written off without looking at what its value could still be. Similarly, when you are evaluating a technology you will know in advance there are going to be decision points. For example, when the technical investigation is done you will ask the question, "Does it still look good?" If the answer is yes, you do a business case investigation after which you will have another decision point. It can help knowing it's not an all or nothing, one-time decision. You've got key points where you're going to decide whether or not to go forward. Stakes, times and markers can be set out in the process. You've got to get past each one in a relatively systematic, structured manner. You also need the desire to move forward and to sometimes take risks even though you don't know all the answers. Unlimited risks can be avoided by phased rollouts and other implementation strategies, including recurrent reviews of whether the benefits ratio is being achieved. VB: You say a crisis, such as an economic downturn, can focus innovation. Is it too early to tell whether the current economic crisis will spark acceleration in the pace of innovation by companies, governments and non-governmental organizations? Jackie Fenn: Certainly the focus, if companies are struggling to survive, can and does change. Innovation depends, to a certain extent, on having slack in an organization – be that people or funding – to try out some new things and accept that they won't all succeed. In tight financial times many organizations have less slack to do that kind of experimentation. However, that same financial pressure can also force people to try new things, sometimes on a smaller scale, maybe more limited in scope. It might be to improve efficiencies. Necessity may force a focus on internal and process innovation rather than a large, risky new launch into a marketplace that may not be receptive. In bad times and in good, there are always opportunities in revenue and product spaces. Everybody says McDonald's is doing great right now. It may require a different focus but there are still opportunities in the marketplace. VB: In the conclusion of your book you pose the question of whether the whole innovation topic is just another fad explained by the hype cycle. And whether in a different economic setting executives will defend their core long-term innovation activities or starve these activities of funds. Have the reactions of corporations to the global economic crisis provided any answers to your question or is it too early to see a trend? Jackie Fenn: We were acutely aware that there was a lot of talk about innovation when we were preparing the book. It meant, since these things have a couple of years, the interest might have moved on by the time we published Mastering the Hype Cycle. In fact, we are still seeing our clients having a lot of interest in innovation. It may be focussed on slightly different areas, but I think the Internet taught people a lot about the need to continually innovate. Companies are a lot more focussed on innovation because they don't want to miss the next big thing, either up or down. They want to have their tentacles out. They want to have the 'STREET' process in place and drive innovation, either for growth or efficiencies. As of yet, we haven't seen any backlash happening. VB: What are some interesting technology trends? Jackie Fenn: The ones I'm excited about are technologies around 3D printing that allow you to create physical 3D models from CAD diagrams. That technology has just crashed in price from about $200,000 to $20,000 for a printer which can actually create physical objects. You can now start to print spare parts in the office, or at some point even for your home. That technology has a very transformational capability. We still haven't explored the full outcomes of the community-based capabilities of the web – Web 2.0 crowdsourcing. How do we take advantage of these capabilities? How can businesses start to use non-employees, volunteers, citizens, customers, or whoever beyond their organization? It's the notion of the virtual organization that has been promised for so long, and we haven't quite got there yet. I think it will manifest itself in very interesting ways over the next decade. VB: You say abundance makes organizations more open to innovation. Isn't it also true that success and abundance often lead to complacency and a lack of incentive to innovate? Jackie Fenn: Yes, that can happen. If you are successful then complacency can set in. On the whole I would say that the leaders in most large industries do tend to be innovative. It's certainly indicated when we look at the budgets they're spending on innovation and their willingness to try out new things, not all of which are going to succeed. Innovation exists when companies have the resources to devote people to it full time. If innovating is only a bit of your job, it tends to get crushed out by the day-to-day realities of having to make things work. But if employees can spend larger chunks of time worrying about the future, innovation will result. If you can cultivate a culture in your organization where people are deliberately spending time on innovations, or you have people looking, worrying, and caring about new technologies, then you're more likely to have innovation happen. Google is always held up as an example of encouraging everybody to try things out and contribute to its culture of innovation. VB: Your focus is on emerging technology management issues and emerging trends. You must have one of the most interesting jobs, plus it's at Gartner Research. Jackie Fenn: It is very exciting and always changing. That's the great thing about the emerging trends space. VB: You are always learning. Jackie Fenn: That's right, always. VB: It has been an honor to talk to the leading expert on the Hype Cycle model. Thank you. Jackie Fenn and co-author Mark Raskino advise us "The hype cycle offers a simple and clear message to those who want to avoid the traps and enjoy the opportunities: don't invest in an innovation just because it is being hyped, and don't ignore a technology just because it is not living up to early overexpectations." None of us is immune to the lure of new technologies and innovation. If I think I am, I am fooling myself. If I think I can resist the forces of the hype cycle without a systematic and disciplined framework to guide adoption decisions for new technologies I'm also fooling myself. The hype cycle explains a lot of things. Now the task is to learn to master it. Jackie Fenn is a vice president and Gartner fellow at Gartner Research, where she focuses on emerging technology management issues and emerging trends. She is the originator of the Gartner Hype Cycle model. 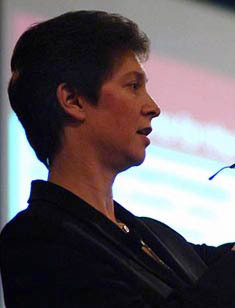 Prior to joining Gartner she was a principal consultant at Logica North America, where she was responsible for artificial intelligence activities within the United States. She has extensive experience in advanced IT assessment, project management, and system development. Jackie Fenn is co-author with Mark Raskino of Mastering the Hype Cycle: How to Choose the Right Innovation at the Right Time. Fenn has a B.S. in Computational Linguistics and Modern Languages from the University of Manchester Institute of Science and Technology in England. To read my other interviews with authors and people interested in innovation, creativity, and business leadership please go to Interviews with Innovation Authors.